Niederkrotenthaler, Thomas, et al. "Role of media reports in completed and prevented suicide: Werther v. Papageno effects." The British Journal of Psychiatry 197.3 (2010): 234-243. Kim, Jae-Hyun, et al. 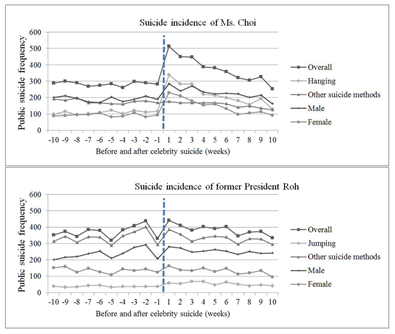 "The werther effect of two celebrity suicides: An entertainer and a politician." PloS one 8.12 (2013): e84876.